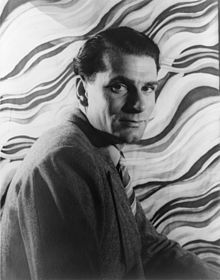 Laurence Kerr Olivier, Baron Olivier, OM (22 May 1907 – 11 July 1989) was an English actor. He was one of the most famous and revered actors of the 20th century. He was the youngest actor to be knighted and the first to be raised to the peerage. Olivier married English actresses Jill Esmond, Vivien Leigh and Joan Plowright. Actor Spencer Tracy said that Olivier was 'the greatest actor in the English-speaking world'. In 1999, the American Film Institute named Olivier among the Greatest Male Stars of All Time, at number 14 on the list. Olivier had many awards: twelve Oscar nominations, with two wins (for Best Actor and Best Picture for the 1948 film Hamlet), plus two honorary awards including a statuette and certificate. He was awarded five Emmy Awards. He was a three-time Golden Globe and BAFTA winner. In 1976 he received the BAFTA Academy Fellowship Award, a lifetime achievement award. Olivier's ashes are buried in Westminster Abbey. ↑ "Picks and Pans: Pages; Midnight Sweets". People Magazine. Retrieved 25 April 2012. ↑ Tracy quoted in By Myself and Then Some by Lauren Bacall (Harper Paperbacks 2006), pp. 214-15. This page was last changed on 22 November 2018, at 09:30.